Japan, 1968, 131 minutes, Colour. 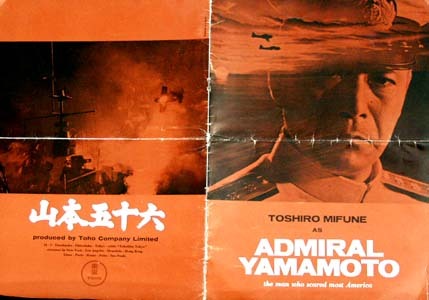 An interesting Japanese film, quite spectacular as well as being a study of the famous Japanese Admiral. Toshiro Mifune, who portrayed him in The Battle of Midway, has a chance to develop a character as well as show Yamamoto in his strategy and action in World War Two. It is very interesting to see the point of view that Yamamoto was at first opposed to the war and then, once it had started masterminded various Japanese strategies. Tora, Tora, Tora, The Battle of Midway, "The Gallant Hours,' with its biography of Halsey, are some examples of American films which explore the same material and are well worth seeing in connection with this Japanese point of view. 1. How interesting a war film? Japanese film, study of a military character? 2. The Japanese view of the war? The background of the 30s? the opposition to the war? The newsreel collage at the beginning, the situation of Japanese-German? treaties? Politics, the military, the navy and their attitudes? 3. The photography, locations, war sequences? The contrast with the human situations? 4. The portrait of Admiral Yamamoto? His career and the stories the sailors told about him, the importance of the opening sequence and his standing on his head in the boat? The various pressures on him for the war? His strengths and weaknesses as man, as a sailor, as an admiral? His decision for attacking the Americans after being pro-America? His personal loyalties to Japan? His hopes of ending the war quickly? 5. His contribution to the plans for Pearl Harbour, for the Battle of Midway and other encounters? 6. The presentation of other Japanese officials? The sailors and the personal stories giving background to Yamamoto's story? Conventional material, appropriate for this film? The preparations for Pearl Harbour and the Japanese point of view, Yamamoto's point of view? The effect of Pearl Harbour and Japanese involvement? 7. The presentation of Japan trying to cope with the war? A more human look them, the propaganda anti-Japanese, points of view? The various crises in the armed services? The need for cooperation? 8. The Japanese defeat and the turning of the war? build-up to Guadalcanal? The movement of the war further south? 9. Admiral Yamamoto's personal involvement, his dedication, the significance of his dressing in white, of his giving an example to the men? His relationship with the men? His going to Rabaul? The build-up to his final flight? His death? The sense of achievement as he died? 10. What insight into the Japanese involvement in the war, the conduct of the war, the cost to the Japanese people, attitudes towards their allies, towards their enemy? Japanese loyalty and devotion? Human qualities transcending facades?